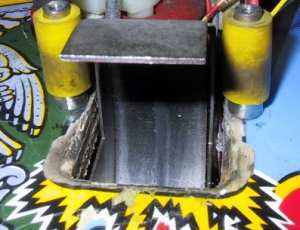 Flippers.be - Restoring, shopping and cleaning a pinball machine - part 3. It is important to make a distinction between cleaning and protecting a playfield. First clean it. Once all dirt is completely gone, we protect the playfield. 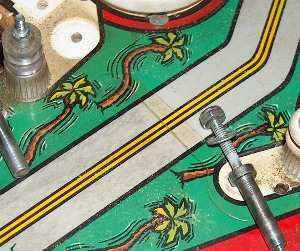 If necessary we can also polish the cleaned playfield, to remove imperfections. Whilst there are products available which do both at the same time, these are better suited for periodic maintenance. With a full shop job, we want to separate cleaning from protecting. When polishing/cleaning, always remember to start with the least aggressive/abrasive product first, and work your way up if necessary ! Don't use too aggressive products all the time as they may damage your playfield after a while. Also take care about the cloths you use, some types of cloth scratch diamondplate. What products you will use depends on the kind of playfield and its condition. Diamondplated or clearcoated playfields (any pinball machine build after 1992) have a thick protective layer on them, so you can also use stronger products on them. Bally/Williams put the logo in the outlane on games made until around 1994. After that playfields were still all clearcoated but they weren't specific labelled as such anymore. Older playfields don't have this type of protection, only 'regular' varnish (lacquer). So you have to pay more attention to which type of product you use. On both types of playfields you have to be careful around playfield wear ! Worn paint means the protective layer is completely worn off, so only use cleaning products on that spot which won't damage paint ! DO NOT USE WATER ! or any other products that are very liquid. Moisture is very bad for your playfield (especially non-diamondplated). So if you test a product, it's best to use it on a cloth. If you apply something directly on the playfield, only use a little, don't let it soak in but wipe it off fast enough. Always inspect the playfield very well before you try a technique. Look at the grey lane on in the picture. This is on an Earthshaker, a game which is not diamond plated. On the top right it's covered by original mylar. Nice grey color, no swirl marks. Then there's a small spot (just left of the metal post) which has never been covered by mylar. The color has changed and there are swirl marks. Finally on the left is a part also covered later with mylar, so the swirl marks are under the mylar ! To clean clearcoated playfields I use Powerhouse. It's strong industrial foam cleaner. It's excellent on diamondplated playfields. On very thick dirt I spray it and let it work for a few seconds and then wipe it off. A lot of products can be used. You can even use foam cleaner for kitchens/bathrooms if you don't find anything better. Just as long as it cleans the playfield, is not too aggressive and not too 'wet'. Products to dewax hardwood floors also work. Some people in the USA use tire cleaner or brake cleaner products, although I don't like them as they are very aggressive. Removing scratches. Polish your playfield.As diamondplate is an automotive clearcoat, you can use almost any product on it that you would use on a car. So there are a lot of scratch removers or polishes you can use. If you don't want to do all the work by hand, you can use a small orbital buffer to buff out small scratches and make the playfield shine like new. I use Commandant 4 on dull playfields. It makes them shine again and also works fine to remove scratches. The magic eraser sponge also works very well if the dirt is difficult to remove, but more on this later..
Update: Commandant 4 is best suited to polish deep scratches away. I now also use Commandant M5 with a buffer to polish playfields. Middle: after cleaning with Powerhouse, this removes most dirt. Right: after cleaning for about 5 seconds with the magic eraser sponge. I even know an operator who only uses chrome polish to clean diamondplated playfields. It cleans and polishes at the same time. This is another example that most people prefer their own way and once they've found a good product they keep on using it. Note: buffing/polishing takes away a small layer of the protective clearcoat, especially if you don't do it manually but use a machine. So while it makes your playfield look like new, it is not protected as good anymore as when it was new. Buffing is not a magical solution you can repeat as much as you want ! It is also possible to use very fine (1500 - 2000 grit or so) wet sandpaper to remove dull marks. Note this only works as long as you still have clearcoat to work on, not if it's already worn down to the paint ! One part I also use the magic eraser sponge is on the ball shooter lane. Usually the clearcoat or lacquer is cracked and there's dirt in it. With the sponge you can clean this very well. Some people spray a new layer of varnish/clearcoat so it becomes smooth again. Spray from high enough, and 'feather' it out at the edge so you don't get a sharp line where the new clearcoat ends. On non-diamondplated machines I spray Powerhouse on a cloth and use that to clean the playfield. A lot of other cleaners are also available. 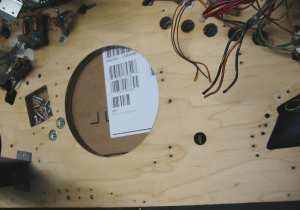 Just remember that the protective layer on this type of playfield is very thin, and products must be suited for painted wood. Don't use products which are too fluid (don't use water) as it'll get into the wood and can do bad things to your playfield.. These playfields sometimes have problems with 'swirl marks'. These are fine black lines, semi-round in shape. A regular cleaner will not get them out. 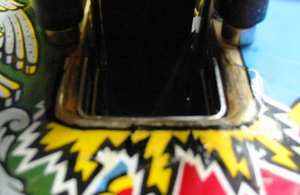 These are actually cracks in the lacquer and paint on the playfield in which dirt is trapped. This dirt goes all through the paint onto the wood. It is possible to use solvents that evaporate and take away a bit of this dirt, but as most of these solvents also attack the paint, it's not a good idea to use them. The best solution people have found is to use a 'magic eraser' sponge. These are sold in shops at the household cleaning supplies, it's a white sponge which will wear away whilst using it. Use it with a little bit of moisture (it's best not to use water but alcohol) and rub hard. Most of the swirl marks will clean well and become much lighter and barely visible. This website describes very well how good it works. Cracked wood or paint. Machines which have been stored in a very dry or hot environment may have cracks in the playfield or paint. Unfortunately there is not a lot you can do about this. Put a good furniture wax on the bottom part of the playfield (the bare wood) to feed the wood, and hope the wood will expand and the cracks will close. But the damage is already done to the paint. On a playfield like this, be very careful when you clean or wax it. Do not use any kind of polish as it will remove paint ! Only a new layer of varnish/clearcoat will prevent this from becoming worse. But if the top layer isn't smooth, even a thick new clearcoat layer will still show irregularities in the wood, unless you fill and level all the gaps before. This Fireball has small cracks in the playfield. Be very careful when cleaning around this area, don't use anything too abrasive ! I only polish/buff non-diamondplated playfields if they are in good condition. As long as the top layer looks good and does not have cracks/swirl marks you can try it. But still be careful and stop often to check for damage. Older games or games with a lot of damage just cannot be restored in as-new condition by buffing. Missing paint won't come back with buffing. Usually I just leave these games as they are, I just wax them well so the wear won't become worse. The only way to make them look better (and usually only worth the effort if they're really valuable) is to repaint them. Using Commandant 4 I have been able to make a Fathom and Taxi playfield look as new again (very smooth and shiny). The dirty top layer of varnish is polished and removed so the vibrant color underneath comes back. It becomes very smooth, the playfields looked already like they were waxed. But again: you have to be careful as there only is a thin layer of protective varnish on top of the paint.. Do not rub too long on the same place or you're going through the varnish and damage paint ! And you have removed a part of this protective layer. So ideally you need to clearcoat/varnish it again or at least keep it waxed very well. The difference between the Commandant 4 and other products like the Magic Eraser or buffing by a machine is that the Commandant is pretty safe, it's created for manual buffing. It may not be super-effective and takes some work, but you don't have the risk of ruining your playfield because you use it 5 seconds too long. The Magic Eraser sponge is much more abrasive. Especially on old playfields you can go right through the paint before you know it ! Older types of playfield usually have a white base paint btw, on top of which the other colors are laid down. So while you're scrubbing and think your playfield starts too look very clean, in reality the colored upper paint layer is worn that much so the white base paint is shining through. Buffing with a machine also has its risks. Real buffers are pretty safe but also don't use them too long. Please don't use a buffing pad on a drill. These are too dangerous to use, unless you already have experience with them and pay attention. Most people set them too fast, apply too much pressure, and if you don't keep it perfectly straight it is very easy to damage the paint. Be careful when you clean the playfield arch ! Most paints used are very sensitive to (aggressive) cleaning products, even modern machines. It's just clear ink or paint on top of the metal apron, without varnish or clearcoat to protect it. You shouldn't use anything stronger than Windex and even then it's safest to test it first somewhere ! Soapy water is the best thing to use on aprons ! Luckily new apron decals are available for some popular games. Adhesive remover, sticker remover or 'Goo Gone'. Let it soak, give it time, pull the edge slightly and let it work further until it completely comes off. Soapy water: put the apron in the water, let it soak, pull up edges which come off ,let it soak further, .. this can take a few hours. Before clearcoat was used, operators could put a piece of mylar on a playfield to protect it from wearing. Mylar is a strong, clear self-adhesive plastic. It has its advantages and disadvantages. It protects the playfield from wear, especially in spots where there's heavy ball traffic or where balls are kicked away with a lot of force. I.e. before slingshots or between pop bumpers you will usually find it. The problem is that it becomes dull after a while and is difficult to remove. Sometimes the glue that holds it comes loose and you get air bubbles (which can fill up with dirt) underneath, which not only looks bad but can even change the path of a rolling pinball. So as long as the mylar is still in good condition (not too dirty, worn, or became loose above light inserts) I would leave it on and clean it as well as possible. Also note the damage on X part of the '5X' insert ! 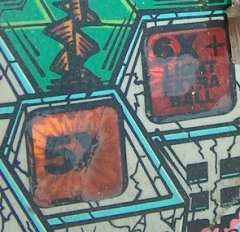 This playfield was already damaged and then a sheet of mylar was put over it. If you do want to remove mylar, there are 3 ways to do so. One is using a hair dryer (not a heat gun as that's too hot and will damage inserts !!!). Careful heat a small edge from the mylar and lift it using pliers. Continue a little bit every time. For a whole playfield it will take you at least half an hour to an hour. So do not rush things and let the glue warm enough each time ! Don't pull too hard or you may lift paint. Especially be careful on recent games which have text printed on light inserts. There it is very easy to lift the text off the inserts. If you lift text, using a clean pallet knife you can quickly press it back to the playfield. The second method is using freeze spray. I have never used it myself but heard a lot of good things about it. It should be easier to do and more safe than a hair dryer, but can only be used on diamondplated playfields ! Just spray it on top of the mylar and the glue will freeze and the mylar comes loose from the playfield. Freeze spray is the same product as in compressed air spray cans. But these you have to use upside-down. 2 or 3 spray cans should be enough to do a whole playfield. The third method is to use chemicals. In the USA you can use 3M Adhesive Remover, in Belgium there's HG Sticker Remover, everyone will have a local version of the product to remove stickers/decals. Try to lift a corner/edge of the mylar and apply the product with a small brush. Let it work for a moment, and pull the mylar a bit up.. apply more of the product if necessary, and continue.. Be careful on older playfields as some chemicals can cloud inserts. Never let chemicals sit for too long on the playfields, wipe them off as soon as possible. Once the mylar is off, use something like glue/sticker remover to remove the glue left on the playfield. Use something plastic and flexible like a credit card to scrub it together and paper towels to remove it from the playfield. Clean the bottom side of the playfield. 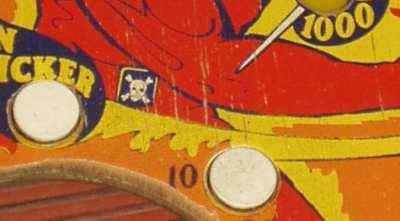 On some games the bottom side of a playfield becomes almost as dirty as the top side. Sooner or later this dirt will find its way up, so you have to get rid of it. With most assemblies removed, you can use a wet rag to clean most of it. If necessary, use sandpaper to careful sand off the thin dirty layer of wood. This will give your playfield a nice clean look of wood again. You can also clean all the wires with a moist rag or portable steam cleaner, be sure then to spray away from the playfield ! The playfield is not made of massive wood, it's plywood: small layers of wood glued onto eachother. 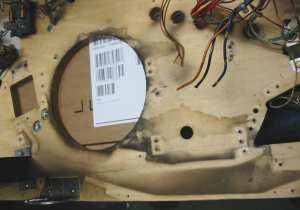 Especially when a part of the playfield became wet or damaged, these layers may separate again. You have to cut away rotten wood, and glue the layers back together. How easy this can be fixed will depend on the amount of warping. Once it's installed in a game, everything is bolted on, and especially when the siderails are on, most playfields tend to flatten themselves. Siderails and backpanel do a good job to get the playfield straight and keep it that way. So a very slight warping will go away from itself. If the warping is really too bad, like more than half an inch, you can straighten the playfield by putting weights on it while it's flat on the ground (and maybe put towels under the 'low' parts), or pressed between i.e. two large flat layers of wood. It may help to make the wood a bit damp, but certainly don't use too much water and first try it without, as usually it is not needed at all. Take enough time, it will take days, up to one or two weeks in some cases. When a playfield is totally clean, it's necessary to put a protective layer on it. This will protect it from wearing any further, and when it becomes dirty again, the dirt will be on top of this layer so it can be wiped off easily. First check if there are playfield touch-ups you want to do. Worn parts can be painted again. Only do this if you are a good artist, so the touch-ups won't be noticed. If you cannot paint that well, it's better to leave the wear 'original'. Do not overestimate your artistic capabilities ! Protecting touch-ups or preventing wear from expanding can be done by putting a piece of mylar over it. But here we have the disadvantage from mylar again: put it on top of bad paint, and when you ever remove the mylar, all loose paint will come with it and damage will be worse. So it's safest to only put mylar on top of paint which is in good condition or on top of very small wear spots ! Don't put it on top of large parts of paints which start to come loose. Or use it as a last resort: on a playfield which is that bad so you are sure you will never try to touch it up, but you don't want it to become worse either. More detailed information about touching up playfields and even a comparison of different types of clearcoat is written down by Clay at his pinrepair website.. So before you start to paint anything, I highly recommend you read every restoration article in detail ! To repaint or not to repaint ? That's the question. Everyone has an opinion about this. Some people prefer to have everything original. This is the 'Smitsonian' principle: only original things are accepted. If a game has wear or a scratch, so be it. It's original. Don't repaint a cabinet, don't put modern clearcoat or other products on top of a playfield which is much older and was produced when clearcoat was not invented yet. Clean and restore it as much as you can, but leave things original. The other group of people just want to make a game look as great/new as possible and use every possible method of doing this. Even if it's an old game, they want to make it look and play like a new one. Touch up wear spots, repaint everything. Clearcoat it so the playfield reflects like a mirror and 50 year old games play as fast as any modern game. What's the best way of thinking ? This is something you have to decide yourself. I prefer to leave things original as much as possible. But I have pinball games to play, I don't really care if the cabinet is faded. I want games to look good and keep them in good shape, but won't loose any sleep over an imperfection. My games are for playing and no masterpieces of art you may only look at. I'm not that good in repainting (and frankly do not have enough free time to do any major restoration), so an older game I will just clean and polish as much as possible and that's it. On modern games I may touch up small details, put a piece of mylar over a wear spot, and that's it. I have never sent away a playfield for clearcoating and probably never will. It also depends where you start from. If a game is in bad condition, something which every collector passes on and may be parted out by someone else, but you can repaint everything so it looks as new, then please do so. It's another game you rescued. On the other hand, if you start with a highly collectible or rare game which is already in good condition (so it's already valuable), then please leave it original. Especially if you can't repaint well or prefer to paint it in a totally different color because then it will match the rest of the room better. On average any repaint will lower the value of a game. Only a perfect restoration may increase its value, especially if it wasn't in the greatest condition to begin with. But then there will be purists who will not be interested in it because it is not original anymore. Left is before, right is after touch-ups. A friend of mine did this to restore a playfield. As you can see, even large areas of playfield wear can be restored.. if you have the patience and skill for it. So don't give up if a game has some wear. If the playfield is in perfect condition (or perfectly touched up) and everything is stripped from it, you can have it clearcoated with 2-components clearcoat. Or you can try it yourself (if you are good at it). It's also possible to use lacquer varnish (varathane) in spray cans (or even brush it on.. although this will not give good results). But then be sure to test these products first. It needs to be a hard clearcoat which will not chip, but may also not become yellow after a while or react with the paint you used to do touch ups. Don't use sharpie pens btw to touch up the playfield if you are going to clearcoat the playfield later ! The ink runs out. Small touch ups can be protected by spraying clearcoat from spray cans. If you do so, make sure to spray a few layers, and feather it out at the edges, so there's a not a sharp edge. Edges of scoops and saucers which are worn can also be filled and touched up. There are several products and methods for this. It all depends how bad it is and how much you want to repair it. The easiest solution is to sand the bad wood smooth and repaint it. Then put some small layers of clearcoat/varnish over it, and buy a metal protector if they're available for your game. If there's a lot of wood worn away, you have to fill this so the hole gets its original side. You can use things like JB Weld, other 2 part epoxies or the epoxy rolls. As every product has its own color you will have to paint it. You should install a metal scoop protector. The epoxies are hard but still are not always hard enough to resist being hit by a pinball. Small parts can and will chip off if you don't have a protector installed. It is also possible to spray some clearcoat or use clearcoat in a small bottle which you apply with a brush (same type as touch-up pens you use to touch up small scratches on your car). The advantage is that it's clear so you don't have to repaint it. But it's also not very strong and can chip off or wear fast. Apply it in multiple, thin layers, not one thick layer ! In the end only a full playfield, professional clear coat job will do a good job of protecting a playfield. Note that clearcoating is optional and is not part of a regular shop-job. It's not something everyone should try or do. Only professionals should do it, as part of a total restoration. Just know it exists so you can investigate it if necessary. 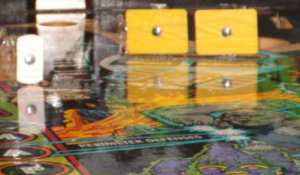 If you find it too dangerous, or want to keep your playfield original, you can use mylar to protect touch-ups or wear spots. If you want to have a clearcoated playfield, it will be best to have a professional have it done for you. Unless you have a paint gun and a separate area and lots of experience, it will be much safer to have it done by someone else. You can go to someone who repairs bodywork on cars, or to someone who makes furniture. 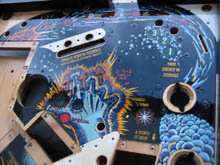 For a non-diamondplated playfield I suggest you look for someone who makes furniture, if the playfield is already clearcoated/diamonplated then someone who does car bodywork will have more experience. Have the playfield sprayed with one or more layers of a clear, UV-resistent polyurethane coat. Let it dry / harden long enough (some types of clearcoat require many weeks) before you assemble the playfield again. It's also possible to do it yourself using spray cans or clearcoat/Varathane but this will be less professional. The best protection for your playfield is to wax it with a hard paste wax. This will put a protective layer on top of the paint/clearcoat. You must do this ! Wax it more than once, put a few layers on top of each other until you see no difference anymore by putting on an additional layer. Now the playfield is empty it's easy to put a few good layers of wax on it. And later on when everything is assembled, wax regularly the parts you can reach. This will keep your playfield clean and protected. I use turtle wax, but there are a lot of waxes you can use. Don't use the cheapest, most liquid stuff you can find. The harder the better. Diamondplated playfields are waxed to make them extra shiny and fast. They don't really need it for overall protection, but it makes a difference to gameplay and still adds a bit of protection on specific wear-spots. On non-diamondplated playfields wax is more important, these types of playfield really need the additional protection wax offers, and it feeds the wood. On older playfields you're better off with a good carnauba bee wax, or (clear) waxes used on furniture, than to use automotive waxes. When assembling the playfield you can also install protectors. Strong metal protectors are available to cover scoop holes. This way they won't wear further. Some types even have an edge which will cover and hide existing playfield damage. These protectors exist for most popular games, as the scoop on every game is different regarding its size and mounting. If one isn't available for your game, you can try to make it yourself. Round metal protectors also exist which fit almost every round scoop. You can install clear plastic (or metal) washers to protect slingshot corners from breaking. But be sure to install it underneath the plastic post and metal pin so it cannot move. Don't put a washer directly underneath the plastic as this will increase the risk of breaking ! Plastic protectors are also available for some games. Orbit Pinball sells protectors for plastic sets. These are strong plastics which are the just a bit bigger than the regular plastics. You assemble them on top of each other. A ball will then hit the strong plastic so the original plastic will not break. Most damage to plastics is done by 'airballs'. These are balls which bounce off somewhere and are launched in the air. A major cause of airballs are worn targets. Normally they have a foam cushion behind them. This wears over time and the target bends back. So check every target on your game, bend it forward and replace its foam backing if necessary. More restoration than shopping, but something you can do when the playfield is stripped: If light inserts are not completely level with the playfield anymore, this has to be corrected. If you don't, the edges will wear very fast. Usually the plastics have raised a bit. Use a hairdryer (NOT a heat gun !) from the underside of the playfield to heat the plastic. This will soften the glue. Then I use a hard, flat piece of wood that is about the size of the insert (just a bit larger) and a heavy hammer.. Put a piece of cloth underneath the wood so you don't damage the playfield. And make the glue warm enough or the plastic can break. If inserts are slightly lower than the wood of the playfield, don't try to hammer them up from the bottom ! The risk on damage is too high - you could raise them too much and damage the paint along the edge. It is possible to do so if you have no other option, and if it's i.e. only one or two inserts which are too low. But be very careful. There is a better solution to level sunken inserts: we have to add something on top of the inserts so they're level with the playfield. You can also use this technique to fill small holes or wear in the clearcoat, or to protect small pieces where you touched-up wear. The trick is to use very liquid Superglue as a kind of clearcoat. Clearcoat is usually quite thick, so you can't use it well to lay a very thin layer. Superglue however is available in very liquid form. It will dry clear (first test the type of glue you have !!) and become very hard. So with a seringe you can put a thin layer on your playfield to fill small holes or lower parts, until they are completely level with the rest of the playfield. With some kitchen paper you can remove any excess. Note: if you installed decals to replace lettering on missing inserts, do not use superglue on top of them. Only use clearcoat on top of decals. Or either raise the insert before installing the decal by heating it and very careful hitting it up, or use superglue before you install a decal. If you want to see how someone applies most of these cleaning/buffing/restoration techniques, I highly suggest you buy the This Old Pinball DVD. Especially the 3rd and 4th (Indiana Jones and Twilight Zone restoration) show in detail how to buff playfields, fill and repaint scoop holes, remove mylar, raise inserts and much more ! I give you some information here but these DVDs go more into detail and more important: you can see how it's done. Cabinet repaints and repairs are shown in the dvds about electro-mechanical restorations and in their latest TOP 7 dvd.